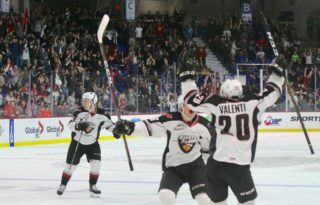 On a night where 50 years of Vancouver hockey memories were celebrated the Vancouver Giants managed to create a few unforgettable memories of their own! 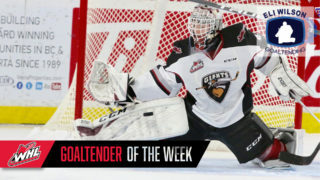 Saturday night in front of 6000-plus at the Pacific Coliseum, the Vancouver Giants (19-6-2-0) grabbed their fifth straight victory, a 5-2 decision over the visiting Tri-City Americans (14-10-1-0). Dawson Holt and Milos Roman each recorded a goal and an assist for the Giants who also got singles from Brayden Watts, Evan Patrician and Bowen Byram. David Tendeck was solid between the pipes making 24 saves on 26 shots faced. Tri-City countered with second period power play goals from Isaac Johnson and Parker AuCoin. 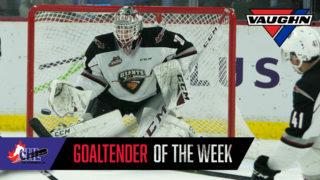 Beck Warm stopped 32 of the 36 shots he faced in the Tri-City goal. The Giants led 2-0 after one after outshooting the Ams 13-7. Milos Roman extended his goal-scoring streak to five games when he tipped home a point shot from Dylan Plouffe. For Roman it was his team-leading 15th goal. 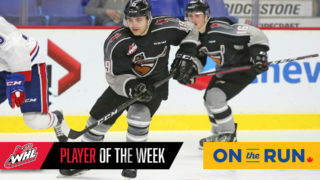 Then at 12:46, right as he left the penalty box, rookie Evan Patrician scooped up a puck, skated down the right-wing and from the middle of the faceoff circle wired a shot up and over the right shoulder of Beck Warm to secure his first career WHL goal. Both teams scored twice in the middle period. Tri-City struck first when Isaac Johnson one-timed a Samuel Stewart pass home for his 10th at 8:25. Dawson Holt restored the Giants two-goal lead at 14:26 when he roofed his fifth of the season over Warm’s shoulder from in close along the left-wing. Owen Hardy drew the lone assist on Holt’s marker. Tri-City moved back within one at 16:35 when Parker AuCoin parked himself in front of David Tendeck, took a pass in close, and then spun and fired home his 13th. Less than a minute later though the Giants made it 4-2 when Brayden Watts lifted his fifth goal of the season past the stick of Warm off a slick feed from Dawson Holt. Shots in the second were 15-9 Giants. The Giants penalty kill came up big in the third period going three-for-three. Their biggest test came in the final minutes where Tri-City was given a 58-second five-on-three opportunity with 2:18 remaining. The only goal that came from that though was a shorthanded empty-netter courtesy of Bowen Byram at 18:55 off a great defensive clear by Davis Koch at the Giants blueline. Next Giants Game: Tomorrow afternoon at 4:00 PM at the Langley Events Centre against the Tri-City Americans. Davis Koch and Dylan Plouffe both extended their respective point-streaks to eight straight games. Plouffe assisted on Milos Roman’s goal in the first period and now has three goals and seven assists for 10 points in that span. Davis Koch assisted on Bowen Byram’s empty-net goal in the third and now has five goals and 10 assists for 15 points in that eight-game span. Milos Roman has now scored in five-straight games for the Giants. During that span, Roman has also added three assists for eight total points. Previously this season, Roman had scored in four straight games (October 6th – October 14th). With the win the Giants improved their record against the US Division to 5-4-1-0. The Giants power play has now scored in five consecutive games. During that stretch the power play has gone 7/23 (30.4%). It took 37 games for the Giants to arrive at 19 wins a season ago. Meaning, the Giants have arrived at their 19th win a full 10 games ahead of last season.